As I noted in an earlier post, my Saison scored relatively poorly in competition, gaining an average score of 25. I actually liked it much more than the judges did, but it inspired me to try again before the next competition. One thing the judges commented on was that there was a mix of spice and fruit in the flavor (all, by the way, from the yeast). They suggested that I pick one flavor and go with it. I decided to focus on citrus, since the weather is finally warming up and a nice citrusy Saison sounded good to me. What follows is my own recipe. 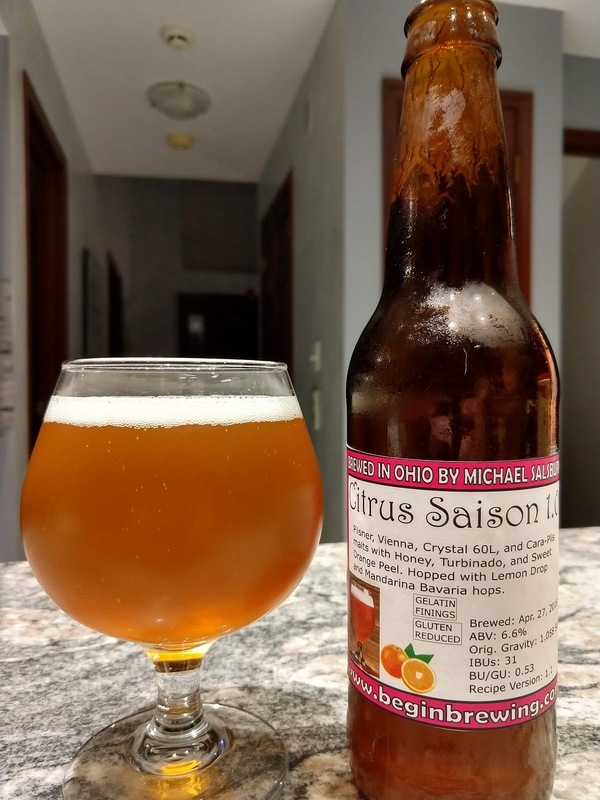 I decided to use Mandarina Bavaria hops, which impart a mandarin orange flavor, combined with Lemon Drop hops, which impart a lemon flavor. That, combined with the citrusy notes that should come from the Saison yeast, ought to tilt the flavor balance toward citrus. We'll see, of course. It is important to note that I did modify the mash profile to include a 15-minute Ferulic Acid rest after the Dough In step, to help the yeast express itself in the beer more. I also modified the first mash step to run at 140F for 45 minutes, then at 157F for 45 minutes, to maximize fermentability. 04/29/2018: During the mash, I noticed that the beer tended to be foaming up through the step filter lid quite a bit, so I refused to walk away for a while. When I finally did, I set two plastic bins underneath the drip tray just in case it decided to flow over the drip tray. When I went down after the brew had finished, I was glad that I did. I measured 20 ounces of wort had spilled out of the machine into the two plastic bins I setup under the drip tray. Had I not set those up, I'd have had a mess all over the floor! I think this is the third or fourth time I've had that issue with the machine. Once the boil started, I knew something was amiss. I expected the boil to run for 45 minutes before the Zymatic added the Mandarina Bavaria hops. Instead, it added them at the start. Ten minutes later, it added the Lemon Drop hops. Five minutes after that, it stopped running. I had forgotten that if you don't set a 60-minute boil addition or manually specify that you want 45 minutes of pre-hop boil time, the recipe crafter will cut the boil short. Usually I catch that before I press the button to brew, but today I didn't. I wound up with a "15-minute-boil" beer. We'll see how that turns out. Yes, I could have boiled it outside the Zymatic for 30 or 45 minutes, but I think that would have destroyed the hop profile I was trying to achieve. When the boil finished, I pumped out the wort, which measure 2.25 gallons. I decided to just ferment it "as is" and not dilute it, since I didn't have the capacity handy to determine whether the 17.8 Brix I measured was close to the expected OG or not. As it turns out, I could have diluted the wort and probably hit my target. I may do that with distilled water at bottling. We'll see. I may instead enter it as a super-strength Saison if it turns out OK. The Picobrew recipe crafter claims this will be a 31 IBU Saison based on a 2.5 gallon volume. BeerSmith says it's likely to come out more like 38 IBUs at 2.25 gallons. That will address another complaint from one or two of the judges, who felt it should be more dry and bitter. 04/30/2018: The airlock on the fermenter is showing significant (even a bit loud) activity, which is a good sign. I had configured the temperature control system to hold the beer at no less than 82F for the first three days, then to raise that to 90F for the remainder of fermentation to ensure that it ferments out completely. 05/08/2018: In order to have this ready in time for competition, I bottled six bottles of the beer today. It has a nice honey color and is already partially clear. I primed each bottle with a Cooper's carbonation drop plus one small Brewer's best tablet. Gravity registered 7.0 Brix on the refractometer which BeerSmith is equating to a final gravity of 0.999 SG. I had been expecting a 9.6 Brix reading at final gravity (1.015 SG). The beer has a nice citrus aroma and flavor, with a hint of warming alcohol. If it's able to condition in time, it could do well in competition. 05/11/2018: I had been conditioning this at 80F in a hot box, and wondered if perhaps the yeast had roused enough to carbonate it sufficiently to take to the competition. It poured almost totally flat, as I suspected would be the case. It has a nice citrus aroma and flavor (though a buttery diacetyl one now as well, since carbonation is only starting). I'm hoping it finishes in time to get to competition. Aroma (6/12): A hint of diacetyl. Nice citrus notes. Mild hop note. Yeast notes subdued. Appearance (2/3): Pale orange yellow. Cloudy. Thin white head with characteristic lacing. Needs more carbonation. Could be clearer. Flavor (15/20): Definite orange note comes through, along with moderate hop bitterness. Malt backdrop is subdued. Finishes clean and slightly bitter. Slight sweetness. Lacks a spicy element, but very drinkable. The diacetyl in the aroma does not appear in the flavor. Mouthfeel (3/5): Medium body. Needs more carbonation. Overall Impression (6/10): It's a good Saison, but not great. Needs more of a spice element and a more expressive yeast, with a spice element. Needs more conditioning time to lose the diacetyl. We'll see (hopefully) in a few days how the actual judges scored it. Compared to my first two versions of a Saison, it seems closer to style. 05/21/2018: The rest of the beer was bottled with a Cooper's carbonation drop in each bottle and placed in my 76F "hot box" to carbonate. The official scoresheets from the Rhinegeist competition rated the beer a 29 official score, based on individual scores of 31 and 27. The judges comments were that the finish was off ("dry but clean"), attenuation and body were low, it finished too sweet, and one of them picked up some acetaldehyde (probably due to it being very recently bottled). My self-score was a point higher than the highest score from the judges, and 3 points higher than the combined score, so I'm in the ballpark but a bit too kind to my own creation. 05/29/2018: There are 11 bottles of the beer remaining at this point. I've offered them to coworkers and expect to give away most of what's left. I'm not thrilled with it so I am fine with having none on-hand if I give all of it away. I entered my ESB v1.2 at Barley's and received some decent scores (28-33), but there were comments about how it was much too bitter (and one from a third judge saying it had no hops bitterness at all). I'm inclined to agree with the judges who found it too bitter. This time around, I want to fix that, so I can put the modified version into competition. After brewing, I had 2.3 gallons, but once diluted to 2.5 gallons with distilled water, the gravity dropped to 1.056 SG (more or less the target). BeerSmith estimates that this beer will clock in around 38 IBUs (where the last version calculated over 50 IBUs) so there should be a significant reduction in bitterness. 04/27/2018: This recipe version increases the Caramel Malt and Victory Malt, but removes the Special B I added to version 1.2. It also goes back to the Lallemand ESB yeast and ditches the White Labs Thames Valley yeast that didn't seem to contribute anything to the beer. Hops quantities were dialed back from something in the vicinity of 1.7 ounces down to 1.2 ounces. That should reduce the bitterness levels back to something more palatable to the judges (and to me, hopefully). 04/29/2018: The airlock on the fermenter has slowed way down, and the krausen inside the fermenter seems to have mostly dropped. A quick taste of the beer yielded mild but pleasant sweetness, not too much hop bitterness, and a nice malt backdrop. I'm hoping the finished beer will match up to this. 05/08/2018: To ensure that I have bottles ready for competition, I bottled six bottles today. I left the rest in the fermenter in the mini-fridge to clarify. Each bottle was dosed with a single Coopers carbonation drop. I didn't take a gravity reading. 05/11/2018: Not that I expected differently, but I opened a bottle of the beer to determine if it was carbonated enough to deliver to the competition. It was not. 05/12/2018: I bottled the remainder of the batch today, with one Coopers carbonation drop per bottle. Yield was 20 bottles (plus the 6 bottles filled on May 8). Final gravity read 8.5 Brix, which calculates to 1.020 SG in BeerSmith, and a final ABV of 4.8% (approximately). This has left the beer with some residual sweetness that reminds me of the Fuller's ESB. If I can get it carbonated in time, it may do well in competition. If not, I'll take the version 1.1 beer. Aroma (8/12): Mild hop aroma with caramel backdrop. Slightly fruity. No diacetyl. Overall the aroma is nicely balanced. Appearance (2/3): Coppery amber color with a bit more than finger-thick head. Decent clarity but there is a touch of haze to it. With a few days in a fridge, I suspect it would be brilliantly clear. The head lasts quite a while. Flavor (15/20): Medium bitterness, followed by caramel and toasty notes, with a hint of fruit (a kind of berry note). Balance is slightly toward hops, but overall balanced. Mouthfeel (4/5): Medium, almost creamy mouthfeel. Medium carbonation. No warming alcohol note (which is appropriate for the style. Overall (7/10): With a bit more clarity, the color and long-lasting head would lend a perfect appearance. The aroma is subtle but blends hops, malt, and a touch of fruit. The flavor blends an obvious but not overpowering hops presence with a nuanced malt backdrop. Could maybe use a touch more sweetness and perhaps a small mineral addition to the water. The previous version, which came out over-hopped, scored a 30.5 average at Barley's. Most of the lost points were around the bitterness and darker color. This version is lighter in color and considerably less bitter. I've purchased ESB style beers that I liked less than this one, so I am quite happy with it. I might experiment with other English hops and minerals in a future version, but this is close to my ideal ESB. It will be interesting to see how the judges react at the Rhinegeist competition, and in a few weeks at the Ohio State Fair. 05/21/2018: The scoresheets from the Rhinegeist competition were posted. The beer scored a 32/50 from one judge and a 35/50 from the other, for a 33.5 official score. The judges' biggest suggestions were that they'd like to see more malt aroma and flavor, more hop flavor and aroma, and more malt complexity. My self score was about 2.5 points higher than the official score, which seems to be a trend. I appear to score myself about 3 points higher than the judges do. A little over a year ago, I came up with a blonde ale recipe based on little more than the fact that one of the home brewing shops online had Mandarina Bavaria hops on sale. I'd never had a beer made with the hops, but their reported mandarin orange flavor sounded like it might make a great beer. I decided to pair it with some orange blossom honey I'd purchased as well as some dried orange peel. I combined all this into a blonde ale recipe and hoped it wouldn't be too much orange. It wasn't. That beer took second place at the 2017 Ohio State Fair Home Brewing Competition in the fruit beer category. It's been popular with friends and family, too. I decided to brew a new batch this year, maybe for competition, or maybe for consumption only. At brewing time, I realized I did not have Bitter Orange Peel or Orange Blossom Honey, so I substituted Sweet Orange Peel and "generic" (natural) honey. When the brewing process ended, I pumped the wort into a kettle for cooling with my immersion chiller. As I did so, I added the 12 ounces of honey. While chilling, the beer was stirred constantly and this should have integrated the honey into it well. 04/27/2018: The beers I've made in the Zymatic to date have been somewhat inconsistent. I went into this brew expecting less than 2.5 gallons, despite specifying that amount in the recipe crafter and even over-adding water slightly to ensure the machine didn't run too low and start sucking in air. I ended up with 2.3 gallons at a higher gravity, but that diluted down to the target volume and gravity more or less perfectly. I have noticed that most seem to be more bitter than I expect. It's worth noting that the Zymatic recipe crafter estimates this beer at 24 IBUs, while BeerSmith estimates something around 32 IBUs for the same volume, gravity, and ingredients. If this beer also comes out unusually bitter, I may use BeerSmith to calculate hop amounts in the future. 04/29/2018: The airlock shows steady activity on this one. I haven't taken a taste sample of it yet, preferring to wait a little longer to let it finish out more of the primary fermentation. 05/08/2018: To ensure that I have bottles ready for competition, I filled six bottles tonight. Each was dosed with four small tablets of Brewer's Best carbonation drops. This is supposed to yield a "medium" level of carbonation consistent with the style. The refractometer registered 6.8 Brix, which BeerSmith adjusts to a final gravity of 1.009 SG (almost exactly the gravity I expected). The beer is a bit bitter at this point, but I find that carbonation offsets that a little, so I'm hoping it will come out balanced at competition time. 05/12/2018: After bottling my ESB v1.3, I moved this beer over to the mini-fridge to cold-crash for a few days before bottling. I'm expecting to bottle it May 16 if it seems clear. 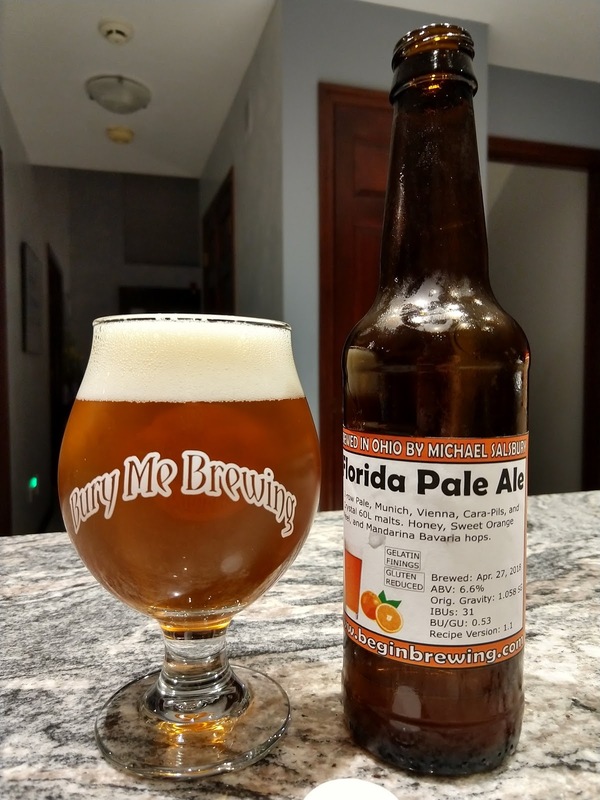 05/16/2018: The beer has turned out much more like a Pale Ale than a Blonde Ale, so I'll be entering into competition and sharing it with others on that basis. I'll need to re-brew it with less hops. 05/20/2018: Here's my self-scoring on the beer relative to BJCP criteria combined for the Pale Ale and Fruit Beer categories. Aroma (6/12): Hoppy initially, giving way to citrus and malt. Appearance (2/3): Slightly hazy gold with finger-thick white head that lasts a while. Flavor (12/20): Starts bitter, then malty, with a lingering bitterness. The citrus that came through earlier seems to have disappeared. Mouthfeel (4/5): Medium mouthfeel. Nice level of carbonation. Overall (5/10): Relatively dry with biscuity malt flavors, plenty of hop bitterness. Orange flavors that were evident earlier appear to have vanished. Finish is bitter and lingering. It will be interesting to compare this score with those from the judges at the Ohio State Fair. This was my second year as a competitor in the Barley's Annual Homebrew Competition. Last year I managed to take third place, losing to the very skilled A.J. Zanyk and his very nice Baltic Porter. It's been on my "bucket list" to see a beer of mine on tap at a brewery or bar, and winning the Barley's competition would make that happen. Holy cow! I actually did it! 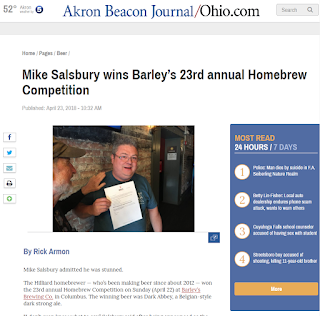 Winning this event means that a year from now I will get to brew Dark Abbey with Barley's brewmaster (and something of a hero of mine) Angelo Signorino, Jr. A few weeks later when the event kicks off, I'll get to tap the first keg of it at the competition. My beer will stay on tap there until it sells out. Bucket list item checked! I'm still reeling a bit from the win. However, reading the scores and the judges' comments on my beer has shown me that there is clearly room for improvement. In late December, I switched from brewing on iMake's The Grainfather RIMS system to brewing with the Picobrew Zymatic. That change has proven to be a mistake at competition time, not because there is anything wrong with the Zymatic, but because it represented a near-total change in process right before competition. With The Grainfather, I had been able to create a formula to ensure that I would hit my volume and gravity targets (or at least be very close). Since switching to the Zymatic, both volume and gravity have been all over the map, but rarely what I expected. Why does that matter? Getting your gravity right means that your hops additions will balance nicely with the malt in the beer. Too much gravity and the beer may become too sweet. Too little gravity and it will seem too bitter. Volume has a similar effect. Too little and the beer can be intensely bitter. Too much and it can be too sweet or at least too thin. On the list above, Tripel Turbinado and Bluegrass State were two beers where I got very close to my targets. They're also the two highest-scoring beers made in the device. The Tropical Stout came out 22 gravity points low, the ESB came in 9 points low and short about a quart in volume, and the Single came out a bit low on volume (and thus more bitter). It's probably not a coincidence that those are lower-scoring beers. Another comment I've seen in multiple notes on different beers is mention of an "apple" flavor. This could just be a byproduct of the combination of ingredients used, but could also signify a problem. Yeast health is a likely candidate, since I rarely use starters (though I do often overpitch). I also don't tend to use temperature control on Belgian style beers, preferring (as many monks do) to let it run its natural course. Sanitation is another potential cause, but that's something I am very meticulous about. I wash and sanitize each bottle and cap I use. I sanitize my fermenters before use, and clean them well with PBW afterward. I try to be careful about oxygen getting into the beer, but perhaps I could do better with that also. Still, I'll revisit my whole cleaning and sanitation effort, as I don't want this off-flavor in future brews. As always, I'll share more as I learn more. As I've mentioned before, I've been trying to perfect (to my taste, at least) recipes for the Trappist Single, Belgian Dubbel, Belgian Tripel, and Belgian Quadrupel. The recipe I've had the most trouble with is the Belgian Dubbel. 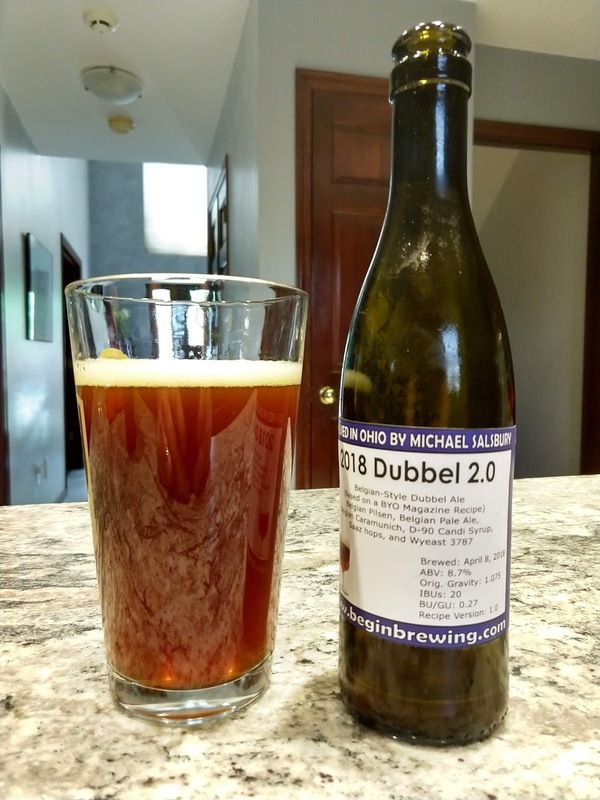 I've made several, and they've all disappointed me, whether they were my own recipe, a published clone recipe for a commercially-available Dubbel I like, or any other. In many cases, they come out too light in color, with little or no dark fruit flavor. In others, they come out dry or overly bitter. My most-recent attempt before today had a practically perfect color but still missed the prune/plum flavor I've been looking for. Today's recipe began as a BYO Magazine recipe for the Belgian Dubbel style, modified a bit. I replaced the hops with my preferred blend and changed the candi sugar rocks out for syrup. Used the Zymatic High Efficiency mash profile with the two main mash step temperatures changed. The first temperature was changed to 144F, and the second to 158F. A 90-minute boil was used, with 30 minutes of pre-hop boil time. The D-90 syrup was added to the beer after the boil, just before the wort was cooled. After brewing, I measured the wort volume at 2.5 gallons and the gravity at 17.8 Brix, which BeerSmith adjusts to a value of 1.075 SG. That's a touch higher than the 1.072 SG I expected. Bitterness recalculates to 20.3 IBUs and Brew House efficiency to 70% for this batch. The wort was chilled to 68F using a sanitized immersion chiller and transferred into a sanitized fermenter. When the yeast packet finally swelled, it was added to the wort along with the White Labs Clarity Ferm and the fermenter sealed. The temperature controller was programmed to keep the wort at 71F for 3 days, then raise it to 80F for the next 10 days. That should ensure complete fermentation, with the 80F temperature providing a little stress to the yeast so that it delivers additional aromas and flavors. I discovered a small crack in the Picobrew Zymatic's step filter, which I snapped pictures of and sent to Picobrew support. Hopefully they'll be able to replace it, as the filter did leak during the post-brew rinse and clean. 04/08/2018: The beer was brewed, yeast pitched, and temperature control configured. 04/09/2018: Upon arrival in the basement, I noticed that the temperature controller was registering 64.5F as the wort temperature. That's much lower than the 71F I had configured. At this point I realized that was because I'd unplugged the heat wrap while configuring the controller. It had been set for a Saison that needed temps well outside this yeast's range, so I unplugged the heat wrap to prevent cooking the yeast. I just forgot to re-plug it. I corrected that and ensured that the temperature was climbing back up to the 71F set point before going to bed. 04/14/2018: The temperature control system has moved the temperature up to 80F to ensure that the beer finishes out its fermentation. A sample taken from the fermenter showed that the beer is a bit sweet, which was not surprising given both the low bitterness level and the fact that the beer had not yet finished fermentation (and thus still had fermentable sugar in it). 04/21/2018: The beer was bottled today, using 1 large Cooper's carbonation drop plus one small carbonation tablet. Final gravity was 8.6 Brix. Yield was 27 bottles. 06/25/2018: The beer pours a coppery brown with thin off-white head that doesn't last long or leave behind the characteristic Belgian lacing. The aroma is malty with some dark fruit. The flavor starts malty and mildly bitter, without a touch of dark fruit. Dark fruit is there, but subtle. I get more burnt sugar, I think, than dark fruit. It's not a bad beer or a bad Dubbel, but it's not what I envision my ideal Dubbel tasting like. If I had to brew this one again, I'd replace part of the Pilsner malt with Cara-Pils to help the beer develop a nice creamy head and some lacing. I'd consider replacing some of the D-90 syrup with some Special B malt, enough to get the color a bit more ruby and hopefully amp up the dark fruit flavor. I'd be looking to hit a color in the upper 30's of the SRM scale.